I used to feel a little guilty about princess paper dolls. I love fairy tales, especially classics like The Twelve Dancing Princesses and East of Sun, West of the Moon. Yes, the whole commercial empire that is the Disney Princess phenomena made me uncomfortable. I wondered, and still do wonder, about the messaging little girls receive about femininity, relationships, and power. 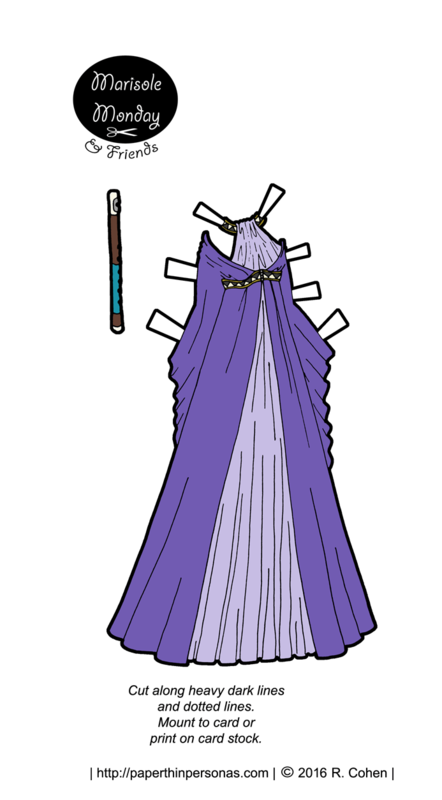 That brings us to this week’s theme of fantasy gowns for Monday’s paper doll, one of the many versions of Maeghan. I have no idea if she is a princess or not, I leave that up to all of you too decide. What I do know about her is that she is a musician, because with today’s printable fantasy gown we have a flute. I played the flute briefly in Middle School. I was not a very skilled flue player, but that’s neither here nor there. As it happens, I have no musical talents to speak of. If you missed the paper doll, here she is, but I also think any of Marisole Monday & Friend’s girls- Marisole, Monica, Mia, Maeghan and Margot would look good in this paper doll dress. I particularly think this Mia paper doll with her red hair would look great in that dark periwinkle color. Tomorrow, there will be another fantasy gown and a book of music, so that’s fun. As always, I’d love to hear what you think in a comment. Currently, I’m soliciting opinions on the new format six weeks in. I am absolutely obsessed with this dress <3 <3. btw the new format is fantastic! Then I think you’ll enjoy the rest of the week. I’m REALLY enjoying the new format! Not that I was around before you started it, but I spent several days going back through the old posts and printing dolls for my six year old. Whew! So much cut out! The new format? VERY friendly for the mom who wants to tell her daughter she’ll only print her one new page today… Lol. It’s saved my hands! It’s also very fun to get a new dress or accessory each day. It draws out the suspense and excitement about each collection. We get to appreciate each piece a little more, because they come a few at a time, instead of having them all at once.